I know I can only speak for myself, but in conversations with other t-girls, it seems one of the many things we have in common is that we have always been who we are, as far back as we can remember. Who we are, what we want to wear and be only grows as we get older. No one outgrows this side of us. So many of us thought we would stop doing “this” when we hit certain milestones in our lives. Whether it was becoming a teenager, becoming an adult or even getting married. But the truth is that we will always be who we are. Which is wonderful, actually, since there’s nothing wrong with who we are. As I hit my teen years I grew bolder and more accepting and understanding (and forgiving) of who I was. I started buying clothes for myself in my teens and purging them a few days or weeks later. When I moved into my own apartment at age 20 I started to build my wardrobe. I still purged but it took longer than it used to. I didn’t purge because I thought I would or could outgrow this, rather I purged because I was terrified of being caught. When I started the MN T-Girls almost five years ago, I really had no idea who would be members, but I expected t-girls from a variety of age groups. Today the members of the group number in the hundreds and although I haven’t met everyone yet, I would estimate that over 90% of the group are in their 40’s or older. This surprises me. Most members have discovered the group by googling “Minnesota” and “crossdresser”. My site is the first option that pops up. When I was in my teens and the internet was in the early days, the first thing I searched was the term ‘crossdresser’. I was amazed at how many results the search provided. It also affirmed my belief that I was far, far from the only one like me out there. My thinking was that as others like us hit their late teens and early 20ths that they would want to reach out to others like themselves. When I started the MN T-Girls, I had thought there would be many members in their early 20’s joining the group as that was the age that I had started to grow bolder and wanting to meet others like myself. But that’s not really the case and I often wonder why. I would have loved to have found a group like the many that exist today in the Twin Cities at that age. I have two thought on this. My first thought is that perhaps a support or social group is just not needed. I started the group because I wanted to connect with others as Hannah. I wanted to have friends as Hannah. There are very, very few people in my life that know me as both of my genders. I had wanted to expand this number but for various reasons I don’t see myself coming out to anyone else in my life. In a recent survey, more U.S. teens than previously thought are transgender or identify themselves using other nontraditional gender terms, with many rejecting the idea that girl and boy are the only options. This aligns with the thought that perhaps the younger generation does not feel the need to seek out support for others like them because they are finding the support within their own current social circles. If their friends and peers are accepting of those who identify as transgender, then the need to find support may not be as strong. I often think that if more people in my male life knew about Hannah, I may not have needed to start the T-Girls. But I’m glad I did. My second thought is that coming out as transgender is still terrifying for many of us and it’s still easy to think that no one would understand or accept who we are, regardless of a survey indicating that more youth are identifying as gender non-conforming. Those in their late teens and early 20’s just simply many not be ready to reach out. As much as I would have moved to have joined a group like the MN T-Girls or attend a PFLAG meeting when I was younger I probably would not have been ready to do so. Although the support and acceptance from one’s peers may be there, there is also more media attention and laws that specifically target the transgender population than ever before. Almost every day there is a news story about a high school and the issue of which bathroom a transgender teenager is allowed to use. Far too often there are reports about a transperson getting ridiculed, hurt or worse for simply being who they are. There may be more acceptance, but there is also more vocalized hate than ever before. From that perspective, it’s not a surprise that more of us are not coming out. But these are just my thoughts. I would love to hear from others on this topic, especially from those in their teens or late 20’s. Yesterday was the monthly MN T-Girls adventure and it was an unforgettable afternoon! The girls visited Midwest Makeup Supply in the Uptown neighborhood of Minneapolis for a day of beauty, makeup lessons and shopping. Midwest Makeup Supply is owned and ran by Corrie, a rockstar in the Twin Cities makeup world. She does everything from bridal to special effect makeup to drag makeovers. 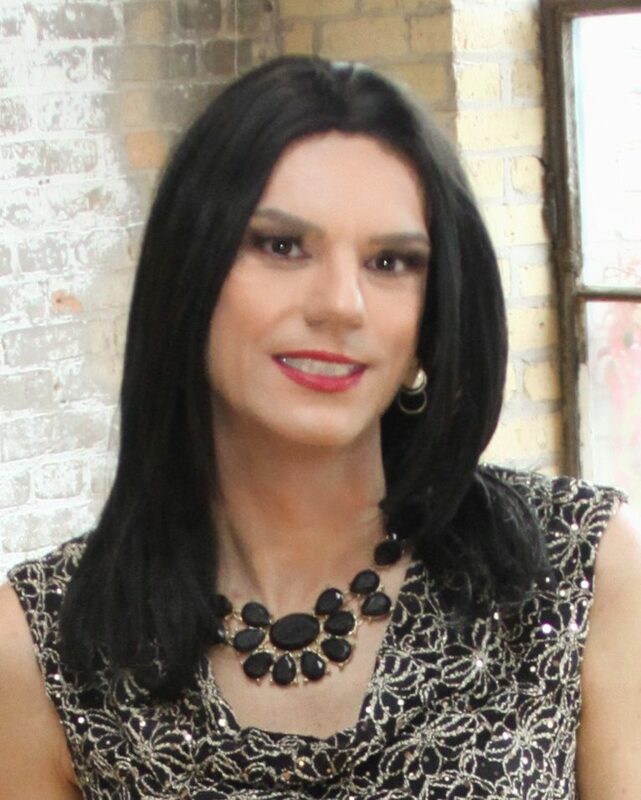 She also does complete gender transformations and will soon have a new photography studio in the Saint Paul area. This was our second visit as a group to Midwest Makeup Supply and it was just as incredible as the first. Corrie started the afternoon with three different makeup demonstrations showing us everything from color correcting/beard cover, highlighting, and contouring. Corrie then moved onto teaching us how to have fuller lips using liner and lipstick and some tricks for our eyebrows. I learned so much about everything from finishing sprays, foundation to primer to bronzer. After the demonstrations were over, it was time to shop! Corrie and Nico helped us all pick out the right foundations, powders, eye shadow, makeup brushes and everything else. After we all maxed out our credit cards we went across the street for dinner at ‘It’s Greek to Me’. In addition to amazing food we were also treated to incredible hospitality and were made to feel very welcome. Huge thanks for Corrie and Nico and to all the t-girls who came to the event. I can’t wait to play with my new makeup! The Super Bowl is in your town this weekend. Are you a football fan? Do you plan to wear a football themed outfit to watch the big game? I am not a football fan, so I am not planning on watching the Super Bowl. But even though I am not a Vikings fan, I still wear purple on occasion. I am proud that Minneapolis is getting a lot of attention at the moment, though. I think we have an amazing city for many reasons. It’s a very progressive city that has a lot of resources and support for our community. In November Andrea Jenkins became the first out trans woman of color elected to public office in America. The University of Minnesota also recently curated an exhibit documenting the history of the transgender and gender non-conforming community. If you’re in town for the game I hope you enjoy our city and I promise you that it’s not normally this cold.